Dissent is an indispensable component of a free and democratic society. Yet, across the globe the right to engage in dissent is increasingly threatened. Join us on Friday, December 7th — the 64th anniversary of the Universal Declaration on Human Rights — as we examine the extent to which the right is acknowledged and protected by Canadian and International law. Speakers will include: Pearl Eliadis, Cameron Ward, Leo McGrady, Q.C., Gwen Brodsky, Rueben George, Phil Lane, Gail Davidson, and Jason Gratl. Presented by: Lawyers’ Rights Watch Canada; Amnesty International; BC Civil Liberties Association; Council of Canadians; and New Media Journalism Program, SFU Continuing Studies. 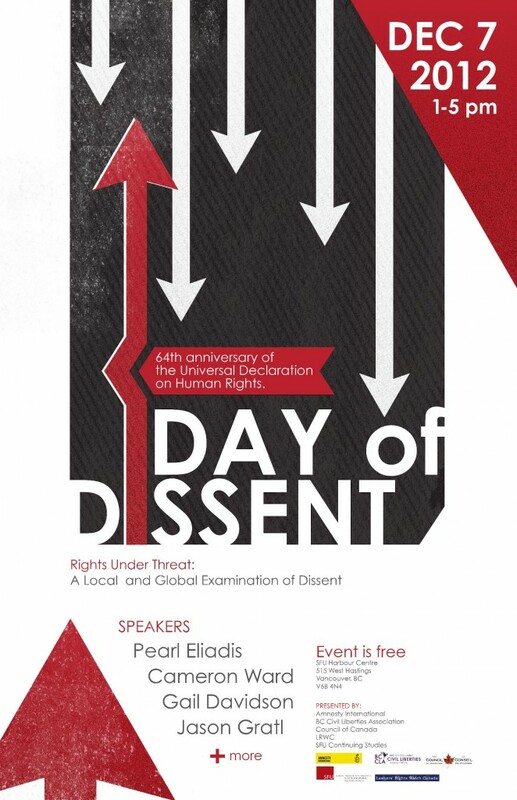 To download a PDF version of the Day of Dissent poster, click here.